Julie-Anne is a Canadian distance cross country and track and field athlete. She spent her University years competing for the Queens University Gaels, becoming the first 5-time All-Canadian at the University. In total, Julie-Anne has been competitively running for 9 years, and in that span she has represented Canada on 4 National Teams. 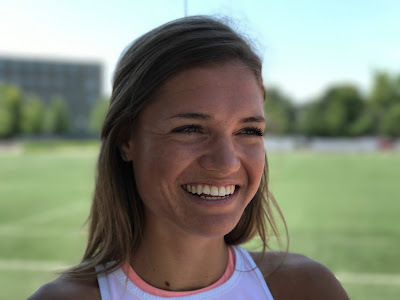 She has raced at the 2014 FISU World Cross Country Championships, the 2014 NACAC Track Championships, the 2016 Pan Am Cross Country Championships, and the 2017 IAAF World Cross Country Championships this past March. Currently, Julie-Anne is training in Kingston, ON with hopes of representing Canada on more National teams, including the team that will be sent to the 2020 Olympics in Tokyo. Welcome to #TeamInfinit, Julie-Anne! Cheat Meal Going back to the main course after dessert. What is your favourite/most memorable moment as an athlete? My parents, for raising me. What does being an athlete mean to you? Learning a lot about yourself. What would be your ultimate achievement in life? Do you have any pre-race/competition rituals? Running through the race in my mind before getting on the line. If you could train with any athlete, dead or alive, who would it be and why? Claire Sumner and Victoria Coates, the best training partners I have and had. What’s something interesting about you that most people don’t know? All of my family is from Switzerland. Two workouts a week, 4 E-days (60-80min), and a Sunday long run… usually works out to 105-135 km. What does a typical “Day in the Life” look like for you? Wake at 8, brew some coffee, pet and feed Charlie (cat), head to the lab, 5 o’clock run, post-run swim, come home and make dinner, play some piano, plan for tomorrow, FaceTime a friend, have a snack, bed by 11 … usually fall asleep with a book. Windsor to Grand Bend - 250 km Made Easy!! !